Vishal Krishna (born 29 August 1977) is an Indian film actor, producer and anti-piracy activist who works in the Tamil film industry. The younger son of film producer G. K. Reddy, Vishal studied Visual Communications at Loyola College, Chennai. He produces films under his production company, Vishal Film Factory. He made an entrance into the film industry as an assistant director for Arjun. He then became an actor and played his first lead role in the romantic thriller Chellamae (2004), before going on to star in the commercially successful films Sandakozhi (2005), Thimiru (2006), Thaamirabharani(2007) and Malaikottai(2007). Following a series of unsuccessful films at the box office, Vishal chose to create his own production studio and has since produced and worked on profitable ventures such as Pandiya Naadu (2013) and Naan Sigappu Manithan (2014). Vishal was elected as the General Secretary of the Nadigar Sangam in October 2015 after initiating a movement against the previous committee. He was expelled from Tamil Film Producers' Council (TFPC) for remarks against the council. Later in April 2017, he won the election and got elected as President of Tamil Film Producers Council. Vishal Krishna was born to G. K. Reddy and Janaki Devi on 29 August 1977. He was born in Chennai. His father was a film producer for Telugu and Tamil films and his family settled in Chennai. His elder brother Vikram Krishna has produced several of Vishal's films and had previously appeared as an actor in films under the screen name of Ajay. Vishal also has a younger sister Aishwarya. Vishal obtained his secondary education from Don Bosco Matriculation Higher Secondary School before securing a degree in visual communications from Loyola College, Chennai. Vishal assisted actor-director Arjun Sarja in his venture Vedham (2001), and a producer spotted Vishal on the sets of the film and signed him to appear in an acting role in Gandhi Krishna's Chellamae (2004). Accepting the role, Vishal prepared by joining Koothu-P-Pattarai to hone his acting skills and played the protagonist role of Raghunandan, whose wife is kidnapped by her childhood friend. A critic described his performance is "apt" but "there was plenty left to hone". His next film was Sandakozhi (2005) with N. Linguswamy, who had previously worked with his father's production house as an assistant director. Vishal was described to have "improved from his Chellamae days" and "clicked as an action hero". Film journalists stated that he was "the fastest rising action hero" of the time. After a cameo as himself in Sasi's Dishyum (2006), he went on to appear in Tarun Gopi's action film Thimiru (2006). The film opened to mixed reviews with Vishal being praised for his intense performance with a critic calling his performance "the film's only strength and, to an extent, making up for the weak script and poor characterisation". The film became Vishal's third consecutive commercial success, and he began to emerge in Tamil films. His next film, the political action drama Sivappathigaram (2006), directed by Karu Pazhaniappan was a failure financially despite favourable reviews. His next film was released in January 2007, Hari's multi-starring family action drama Thaamirabharani (2007) and the film went on to gain considerable box office success, carrying good reports amidst other big budget releases. Later in the year, he appeared in Boopathy Pandian's Malaikottai (2007), a comedy entertainer. In his first full-length comic role, Vishal received mixed feedback for his portrayal from critics, with Rediff stating that he is "a far cry from the rather endearing young man in Sandakozhi", whilst describing his performance as "cringe-able". Behindwoods stated it as an "Average masala-mix entertainer". The film took a large opening and was declared a blockbuster, featuring in the top 10 at behindwoods box office. In the year 2008, for the first time, Vishal portrayed a police officer in Sathyam, which became a commercial failure at the box office. Then both his films Thoranai (2009) and Theeradha Vilaiyattu Pillai (2010) were just average grossers. Vishal was then given the opportunity to feature in Bala's dark comedy Avan Ivan (2011), after being recommended to the director by his friend Arya. Portraying a village stage actor with a squint, Vishal had severe eye pain and headaches, and he also had a serious muscular injury on sets. The film opened to mixed reviews, though Vishal's performance won positive reviews. Indiaglitz stated that Vishal delivered an "award winning performance" and that his "mannerisms and body language give you goosebumps". The reviewer further cited that "Vishal's spontaneous response to his mentor's death in the movie is touching. His demonstration of Navarasas in front of actor Suriya will melt you in tears". Vishal played the role of a police officer in his following release Vedi (2011), directed by Prabhu Deva, which was declared an instant flop at the box office. In the 2013 film Samar, Vishal played a forest trek guide. Behindwoods stated that he "rocks in the action sequences". He appeared in three more films that year. Following a cameo role in Theeya Velai Seiyyanum Kumaru, he starred in the action films Pattathu Yaanai and Pandiya Naadu. The latter was Vishal's debut production venture. Vishal opted to produce and collaborate with Thiru for a third venture Naan Sigappu Manithan (2014), a revenge drama, in which his character had narcolepsy. 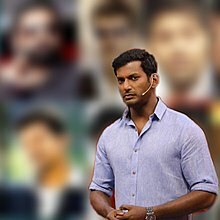 To prepare for the lead role, Vishal read up and studied real life case studies of people with the disorder, citing that there were no references from cinema which he could watch and learn. Then he had acted under director Hari for the second time in Poojai (2014), which did somewhat good business at the box office. In 2015, he acted two films, namely, Aambala and Paayum Puli, both turned out to be flops at the box office. He was elected as President of Tamil Film Producers Council election, which was held on 2 April 2017.. Apart from this, Vishal is also a staunch advocate against online piracy since 2014, having started an anti-piracy cell. He made his television début in October 2018 as a host of Sun Naam Oruvar, a talk show airing on Sun TV. Vishal filed his nomination as an independent candidate for the by-poll to the high-profile RK Nagar constituency in Chennai, which fell vacant following Jayalalithaa's death in December 2017 . It has caught major political parties and Kollywood by surprise, as Vishal rushed into politics where superstar Rajinikanth and Kamal Haasan were still waiting to tread. But to his dismay, Vishal's nomination for Chennai's RK Nagar by-election was rejected . ^ a b "Vishal celebrates his birthday". Sify.com. Retrieved 19 October 2015. ^ "A meaningful birthday celebration for Vishal". Sify.com. Retrieved 19 October 2015. ^ "Actor Vishal riding on success". The Hindu. 26 November 2006. Retrieved 8 February 2010. ^ "Naan Sigappu Manithan hits 50". The Times of India. 30 May 2014. Retrieved 19 October 2015. ^ "Nadigar Sangam election dates announced". The Times of India. 8 September 2015. Retrieved 19 October 2015. ^ "Vishal removed from Producers' Council - Times of India". The Times of India. Retrieved 20 November 2016. ^ "Vishal Expelled from Producer's Council". Chitramala. 15 November 2016. Retrieved 20 November 2016. ^ "Vikram Krishna weds Shriya reddy". Sify. 8 March 2008. Retrieved 9 January 2011. ^ "Star Interviews : Hero Vishal: Interview and profile". Telugucinema.com. Retrieved 10 May 2013. ^ a b "Interview with Chellamae Vishal". IndiaGlitz. 20 September 2004. Retrieved 7 January 2011. ^ Rangarajan, Malathi (17 September 2004). "Chellamae". The Hindu. Retrieved 9 January 2011. ^ "Chellamey". Sify. 20 September 2004. Retrieved 9 January 2011. ^ Prasad, G. (11 March 2006). "Riding high on crest of success". The Hindu. Retrieved 9 January 2011. ^ "Sandakozhi". Sify. 14 November 2005. Retrieved 9 January 2011. ^ "Vishal-The dark horse!". Sify. 9 May 2006. Retrieved 9 January 2011. ^ Sudha, S (4 August 2006). "Thimiru is a time-pass flick". Rediff. Retrieved 9 January 2011. ^ "Vishal alters the list of top heroes in Kollywood!!". Behindwoods. 8 August 2006. Retrieved 9 January 2011. ^ Rajaraman, R (25 November 2006). "Sivapathigaram Review". Nowrunning.com. Retrieved 13 January 2011. ^ Iyer, Sriram (14 January 2007). "Thamirabharani is worth a watch". Rediff. Retrieved 13 January 2011. ^ "Box-office analysis". IndiaGlitz. 18 January 2007. Retrieved 13 January 2011. ^ Srinivasan, Pavithra (28 September 2007). "Malaikottai is avoidable". Rediff. Retrieved 13 January 2011. ^ "Malaikottai – Masala comedy, no strings attached". Behindwoods. 28 September 2007. Retrieved 13 January 2011. ^ Manigandan, KRI (22 January 2011). "Vishal: A squint to success". The Times of India. Retrieved 28 January 2011. ^ Vaadu Veedu Telugu Movie Review. IndiaGlitz (17 June 2011). Retrieved 24 June 2012. ^ Janani Karthik (9 July 2012). "I didn't work for awards, says Vishal". Deccan Chronicle. Chennai, India. Retrieved 18 July 2012. ^ "Vishal's third project in a row". Behindwoods. 28 January 2011. Retrieved 29 January 2011. ^ "Samar Movie Review". Behindwoods. 13 January 2013. Retrieved 10 May 2013. ^ "Samar Tamil Movie Review". IndiaGlitz. 12 January 2013. Retrieved 10 May 2013. ^ Top 10 Tamil grossers of 2013 – The Times of India. The Times of India. Retrieved 17 September 2015. ^ 2013 – The top 10 Tamil grossers. Sify.com (2 January 2014). Retrieved 17 September 2015. ^ "Vishal's role in Malayalam debut revealed?". ^ IANS. "Vishal to play the main antagonist in Mohanlal's next?". ^ "Thupparivaalan (2017) | Thupparivaalan (Thupparivalan) Tamil Movie | Thupparivaalan Review, Cast & Crew, Release Date, Photos, Videos". FilmiBeat. Retrieved 12 January 2019. ^ "Vishal-Samantha's 'Irumbu Thirai' to release on May 11 - Times of India". The Times of India. Retrieved 12 January 2019. ^ "Review : Sandakozhi-2 review:A watchable rural action entertainer (2018)". www.sify.com. Retrieved 12 January 2019. ^ "Vishal's Namma Ani wins TFPC election hands down". Top 10 Cinema. 3 April 2017. Retrieved 4 April 2017. ^ "Vishal pulls off a stunning victory in Tamil Nadu Producers' Council elections, vows to end piracy". The Indian Express. 3 April 2017. Retrieved 4 April 2017. ^ "Tamil Nadu Film Producers Council Election, 2017 - Complete Winners List". www.moviecrow.com. Retrieved 4 April 2017. ^ "Now, the battle against piracy has begun: Vishal". timesofindia.indiatimes.com. Retrieved 4 April 2017. ^ "Actor Vishal follows Kamal Haasan's footsteps; enters small screen as a host - Times of India". The Times of India. Retrieved 6 January 2019. ^ "Actor Vishal's new TV venture to premiere soon - Times of India". The Times of India. Retrieved 6 January 2019. ^ "Vishal contests RK Nagar elections: Puratchi Thalapathy's political plunge was a long time in the making". Indian Express. ^ "RK Nagar Nomination Rejected, Actor Vishal Says "Mockery Of Democracy"". NDTV. Wikimedia Commons has media related to Vishal (actor).